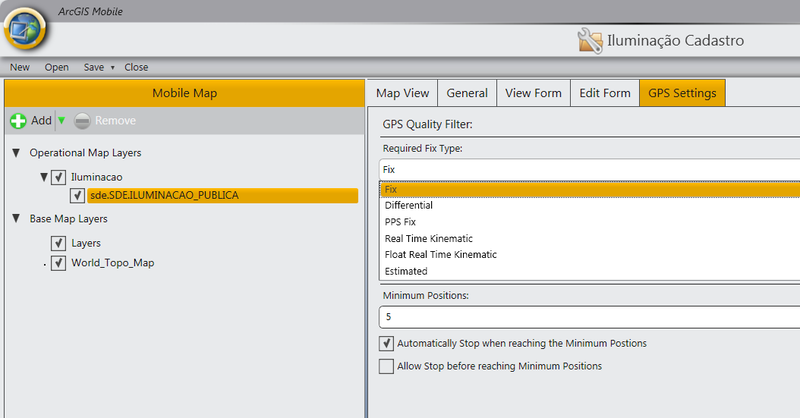 So you are configuring a ArcGIS Mobile Project in ArcGIS Mobile Project Center. You check the General tab, the View and Edit Form tabs and all is very intuitive and straight forward. Until you get to the GPS Settings tab. To be more precise the Required Fix Type. It is not easy to find information on what to these options mean. The only place I could find was on the ArcGIS Mobile SDK reference pages. So I compiled here the meanings and applications of each. But first of all, what is Required Fix Type? The Required Fix Type is a way to ensure that the location of the features collected in the field will be preformed by GPS and that the minimum GPS quality required will be the one you select here. Lets say you choose the option Real Time Kinematic. This way, you will only be able to mark the location of a feature in the map if the type of signal you are getting on your mobile device is coming from a RTK receiver. ESTIMATED or Dead reckoning is the determination of a location based on computations of position given an accurately known point of origin and measurements of speed, heading and elapsed time. Dead reckoning coupled with GPS positioning provides a powerful navigation solution. GPS positioning provides highly accurate "points of origin" when exposed to sufficient satellite signal strengths during a trip. Dead reckoning can be used to "fill in the gaps" when there are insufficient GPS signal strength to obtain an accurate position. FIX indicates a standard GPS signal, or Standard Positioning Service (SPS) is being used. SPS is the standard specified level of positioning and timing accuracy that is available, without qualification or restrictions, to any user on a continuous worldwide basis. The accuracy of this service will be established by the U.S. Department of Defense based on U.S. security interests. DIFFERENCIAL indicates that Differential GPS is being used to proved increased accuracy over Standard Positioning Service (SPS). This technique uses a network of fixed ground based reference stations to broadcast the difference between the positions indicated by the satellite systems and the known fixed positions. These stations broadcast the difference between the measured satellite pseudoranges and actual (internally computed) pseudoranges, and receiver stations may correct their pseudoranges by the same amount. REAL TIME KINEMATIC or (RTK) satellite navigation is a technique used in land survey based on the use of carrier phase measurements of the GPS, GLONASS and/or Galileo signals where a single reference station provides the real-time corrections of even to a centimeter level of accuracy. When referring to GPS in particular, the system is also commonly referred to as Carrier-Phase Enhancement, CPGPS. This GPS technique uses the radio signal (carrier) to refine it location initially calculated using DGPS. The receivers are able to reachy this level of accuracy by performing an initialization, that requires data from at least five common satellites to initialize on-the-fly (in motion) tracking at least four common satellites after initializing. FLOAT REAL TIME KINEMATIC ( Float RTK) is very similar to the fixed RTK method of calculating location, but is not as precise, typically around 20 cm to 1 meter accuracy range. This decreased accuracy is offset by increased speed, since the time consuming initializaton phase is skipped. PPS FIX indicates that Precise Positioning System, encrypted for government use is being used by the receiver. PPS is the most accurate positioning, velocity, and timing information continuously available, worldwide, from the basic GPS. This service will be limited to authorized U.S. and allied Federal Governments; authorized foreign and military users; and eligible civil users. Unauthorized users will be denied access to PPS through the use of cryptography.